Following the announcement earlier this week that American director Cary Joji Fukunaga has replaced Danny Boyle as director of Bond 25, along with a new release date of Valentine’s Day 2020, MI6’s top man has been on the name on everyone’s lips. But how much do we really know about 007? Have you ever wondered which Bond has had the most success with the ladies, who fired the most weapons, or who utilised the most gadgets? 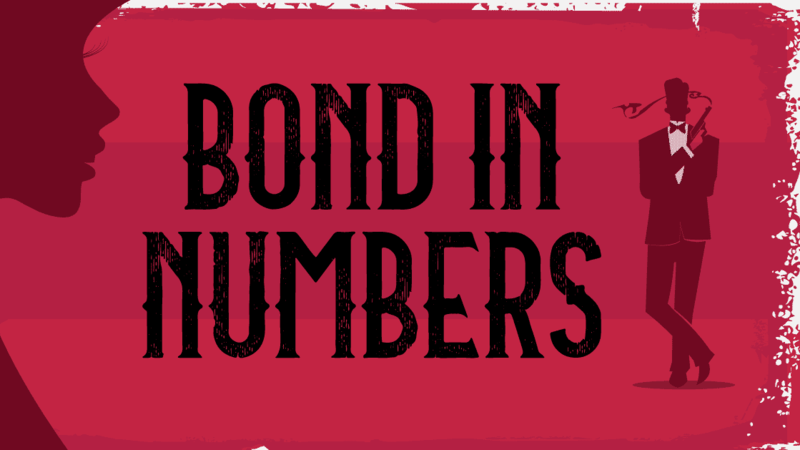 Bond in Numbers collates all of this data from every film, looking at every imaginable 007-related statistic. All 24 official Bond films are analysed in detail, to determine the number of villains killed, romantic liaisons, units of alcohol consumed, casino visits, classic catchphrases spoken, guns fired, gadgets used and cars driven. The extensive guide from online casino Betway compares the profit made from each film, both at the box office and after inflation, and how the theme song from each film performed in the UK charts. It also includes trivia, fun facts and never-before-seen data from S.P.E.C.T.R.E. Skyfall is the most successful film with $910,526,981 in profit, while Spectre boasts the highest-charting theme song thanks to Sam Smith’s Writing’s on the Wall. Bond uses the most gadgets in Moonraker and goes through an outrageous four cars in Diamonds Are Forever and Quantum of Solace. You may know that 007’s drink of choice is a vodka martini, but did you know that he only says his iconic catchphrase “shaken, not stirred” 12 times throughout the franchise? However, “Bond, James Bond” gets 25 outings across the 24 films. We all know 007 likes his ladies and the data proves it, with a grand total of 58 romantic liaisons throughout the franchise. Sean Connery’s You Only Live Twice and Roger Moore’s A View to a Kill boast the most, with four encounters in each film. Bond in Numbers allows users to break down the statistics by individual film and also compiles the best of Bond to see the stand-out facts at a glance. Fascinating facts from the franchise are also included, including the origin of the Walther PPK, how to make a proper vodka martini, and Sean Connery’s brush with death on the set of Thunderball.